They’ve found an object out there that behaves unlike anything else. Where Earth, Mars, and the other planets in our solar system travel on a flat plane in relation to the Sun, this object, and the cluster of other objects around it, doesn’t. The Trans-Neptunian Object, nicknamed “Niku” after the Chinese word for rebellious, orbits in a plane that is tilted 110 degrees in relation to the plane of the planets. Even more weirdly, it orbits the sun in the opposite direction of almost everything else in the solar system. The TNO is tiny — about 124 miles in diameter — and is 160,000 time fainter than Neptune. So what is the TNO, exactly, and why is it behaving so weirdly? Scientists think it must have been knocked off course, either by the gravitational effects of some unknown, massive object, but they’ve found no evidence of that so far. And, of course, there will be people who wonder whether the TNO isn’t following the rules of the rest of the solar system because it actually isn’t part of the solar system at all — it’s some huge ship, or beacon, or some other indicator of extraterrestrial intelligence. I’ve often wondered what would have happened if America hadn’t put the brakes on its space program after the Apollo flights ended, and had spent the last 45 years perfecting interplanetary travel, building bases, and taking humanity out into the rest of the solar system. In that alternative world, we might have been in a position to send a ship out to check out Niku, and see just how rebellious — or unusual — it really is. If you’ve read anything about the early days of Earth, you’ve read about how our home planet had a thick, heavy atmosphere, filled with greenhouse gases that trapped heat and allowed early plants and other organisms to take root and ultimately thrive. That was the prevailing scientific consensus. Recent studies of gas bubbles trapped in a lava flow that occurred 2.7 billion years ago show that the atmosphere of the early Earth was much, much thinner than scientists had assumed — less than half as thick, in fact, as our current atmosphere. That’s a surprise, because it is clear that the sun was weaker in those days, and a thick atmosphere was thought to be needed to make the Earth warm enough to support life. With a thin atmosphere, Earth must have been a daunting place for the early photosynthetic life forms — but somehow those hardy little creatures survived anyway and started the process that ultimately led to . . . us. It’s long been clear that the environment of planet Earth is ever-changing, but the studies of the gas bubbles indicates that the changes over time are even more significant than was suspected. That’s an interesting discovery, but it might also have practical consequences in our search for life forms on other moons and planets. Scientists searching for extraterrestrial life tend to look for planets that are “Earth-like” in the sense of modern-day Earth — but it turns out our own planet wasn’t very “Earth-like” at all in its early days. The range of places that could support life therefore is likely much wider than previously suspected. So scientists are wrong about the early atmosphere on Earth, just as they have been wrong about countless other things during the long and rich history of science. That’s the great thing about science — inaccuracy and failed hypotheses are just an inevitable part of the process. In this case, the scientific error also happens to tell us something useful and gratifying about just how tenacious life forms can be. Scientists are now finding evidence that there are a lot of apparently habitable planets out there, in a temperate zone in relation to their suns, where water is likely to form. So why in the world (pun intended) aren’t we hearing or seeing signs of alien life when we point our radio telescopes at other star systems? Our ability to search for evidence of life elsewhere has developed to the point where the lack of any contact has to be considered in any scientific theory about how life develops — and scientists are, in fact, doing just that. The new theories posit that the world — our world — in fact played a key role. They envision a “Gaian Bottleneck”: a kind of choke point that most alien life doesn’t survive. While early, microbial life forms may have developed on those wet, rocky planets scientists are identifying just about everywhere, more complex life forms require planets with weather systems and atmospheric that are relatively stable. The Gaian Bottleneck posits that such stability is lacking on many planets, and that changes in temperature or atmosphere killed off the alien life when it was in its fragile, early stages and unable to defend itself through evolution. Thus, both Venus and Mars may have had early life forms, but the developmental arc of those planets — toward a high-pressure hot house on Venus, and a frigid, barren desert on Mars — killed them off. Earth, though, somehow threaded the needle. So, we’re special. Of course, Earth’s example means some planets make it past any Gaian Bottleneck, so there may be advanced life out there — just not as much as you might think. NASA’s Curiosity rover has once again excited scientists with some provocative discoveries about Mars. 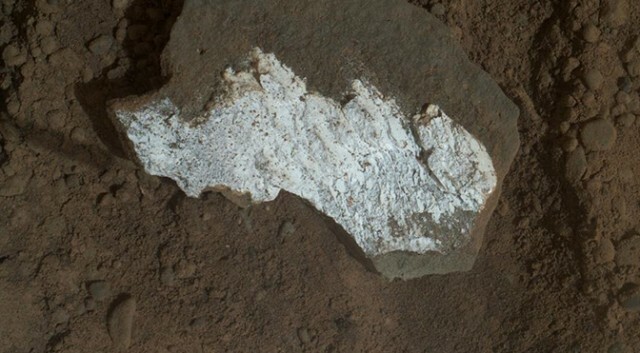 Curiosity drove over a Martian rock and broke it open, exposing a dazzling white exterior. The striking ivory color indicates the presence of hydrated minerals in the rock. As any person who walks around with a water bottle knows, “hydration” requires water, and hydrated minerals are those that are formed when water is found. Curiosity also has detected clay-type minerals in a different rock — another clue suggesting the presence of water at some point. These discoveries are part of a growing body of evidence that running water once existed on this part of the surface of Mars. On Earth, water seems to have been a crucial building block in whatever process, or outside force, first created life. If water flowed on the Red Planet, the odds are increased that life once existed there — and may exist there still. Although the surface of Mars is now a dusty red desert, it is possible that water and ice remain in rock formations deep below the Martian surface. If so, life may be found there, because studies on Earth indicate that life, once established, is remarkably hardy. The expedition to drill into a lake buried beneath a two-mile thick sheet of ice in Antartica, for example, recently uncovered life forms even in that dark, desolate, and inhospitable location. Why should life on Mars be any less tenacious? I’m of the Star Trek generation. I believe that looking for — and especially finding — life beyond the confines of our home planet is a good way to get squabbling humans to recognize that their differences are minor and not worthy of much attention in the grand scheme of things. We need to move beyond a mindset that focuses exclusively on our own fleeting creature comforts and recognize that we live in but one tiny, wayward corner of an unimaginably vast universe. It’s been 40 years since humans walked on the Moon. When will we take the next step, to Mars and beyond, to see whether life in fact may be found elsewhere? The search for extraterrestrial intelligence has made huge strides in recent years. Using new techniques, scientists have identified many apparently habitable planets, thereby suggesting that the first ingredient of extraterrestrial intelligence — a planet where a sophisticated alien race might develop — is much more common than people once thought. Studies have shown that life has developed and thrived in the most inhospitable climates on Earth, from superhot underseas vents to the coldest ice caves at our poles. And now, astronomers are targeting specific stars with radio frequency searches designed to hear any radio wave activity. The astronomers examined Gliese 581, a red dwarf 20 light years away that is orbited by six planets, including two jumbo-sized Earth-like planets. If Gliese 581 were aiming a similar array at Earth, it would hear countless radio broadcasts from 20 years ago — lots of the music of Nirvana, and reports on the upcoming Bush-Clinton presidential election, no doubt. But from Gliese 581, the astronomers heard . . . nothing. If there is life on the planets in the Gliese 581 system, it either hasn’t progressed to the point of using radio technology or uses some other form of communication we haven’t discovered. The fact that we haven’t heard an answer yet doesn’t mean life isn’t out there somewhere. The technique used on Gliese 581 was targeted at a small dot in a universe that has countless such dots. The astronomers could experience years of radio silence from their targets, but the world would change immediately if the radio astronomers heard alien communications from just one target — as was the case in Maria Doria Russell’s excellent novel The Sparrow. We don’t know if we’re unique, and whether Earth is the only planet in the vast universe where intelligent creatures capable of extraterrestrial communications have developed. Being something of a skeptic, I’m not willing to accept that proposition. Time, and some more efforts to listen in on alien radio, will tell. America’s unmanned space probes continue to do amazing things — including discovering that one of Saturn’s moon has salt water oceans like those on Earth. 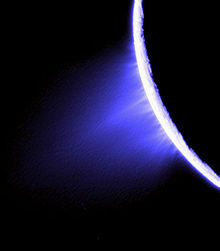 The discovery was made by the Cassini spacecraft, which has been flying around the huge gas giant and its famous rings. Cassini reached a point within 46 miles of the south pole of ice-covered Enceladus, one of Saturn’s many moons, and on its close pass Cassini actually flew through the jets of water vapor and ice that make up the geysers emanating from the moon. In so doing, the probe “tasted” the vapor and determined that it consists of water, organic compounds, and salt, at the same salinity levels as Earth’s oceans. The evidence suggests that there are liquid oceans underneath Enceladus’ icy crust, and that the water may be in contact with the moon’s rocky core — which could be supplying the chemical compounds that are the building blocks of life. This discovery makes Enceladus a prime candidate for another mission designed to determine whether life in some form actually exists on the moon. We’ll just have to hope that we can find the money necessary to fund the mission that will follow up on this very intriguing discovery.